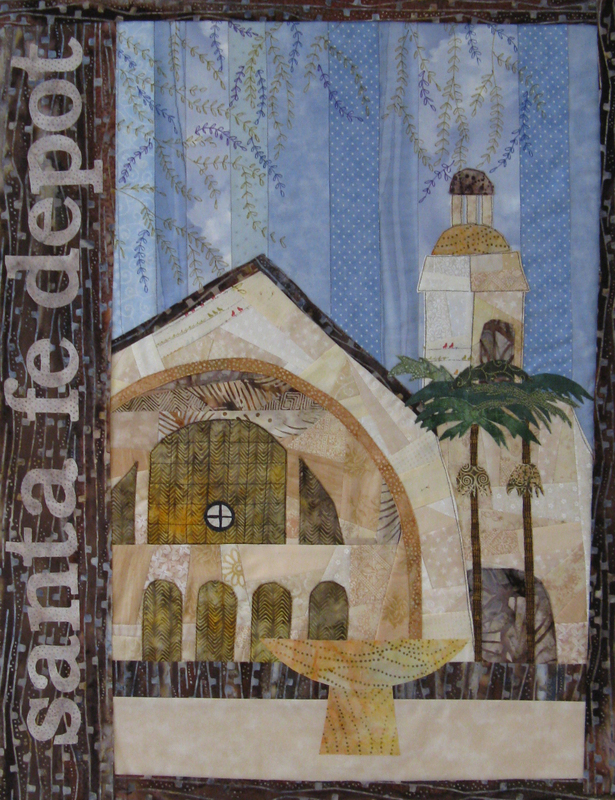 Here is my quilt of the Santa Fe Depot in San Diego. I haven't quilted it yet but hopefully will get it done in the next few weeks. This is amazing!!!! You have done a fantastic job on this, I love it!!! It actually took me a second to realize it was a quilt interpretation of the picture, I thought it was an artsy postcard!!! Beautiful!!! you are one talented woman and I love to see your work!!! I agree that it a stunning interpretation of the original image. Beautiful image of the subject that you chose. You nAiled it Ellen!! beautiful!!! Great photo...but I think your version is even more wonderful. 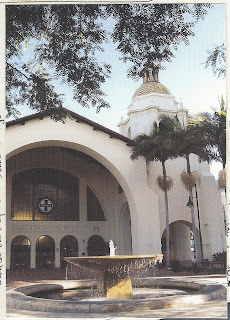 Especially like your variety of whites and your delicate foliage. 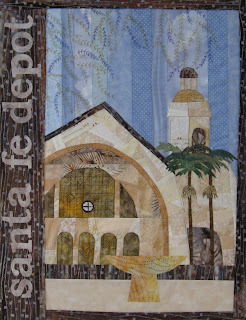 The "made" fabric is so perfect for the stucco texture! A beautiful piece. What a wonderful rendition of this depot. You've done a marvelous job. Are the frilly branches embroidery? You've made an amazing textile here, Ellen, it actually looks better than the original picture, something which I think is very, very difficult to do. Love your lettering and the embroidered leaves and how you used those batiks! Beautiful! This is perfect, Ellen!!!! Great job. This is absolutely incredible! You've done a very fine job!